math engine, along with the die temperature (TDIE). are stored in the built-in nonvolatile EPROM memory. programmed in either comparator or interrupt mode. interfaces, and allows up to eight devices on one bus. voltage is ideal for battery-powered applications. 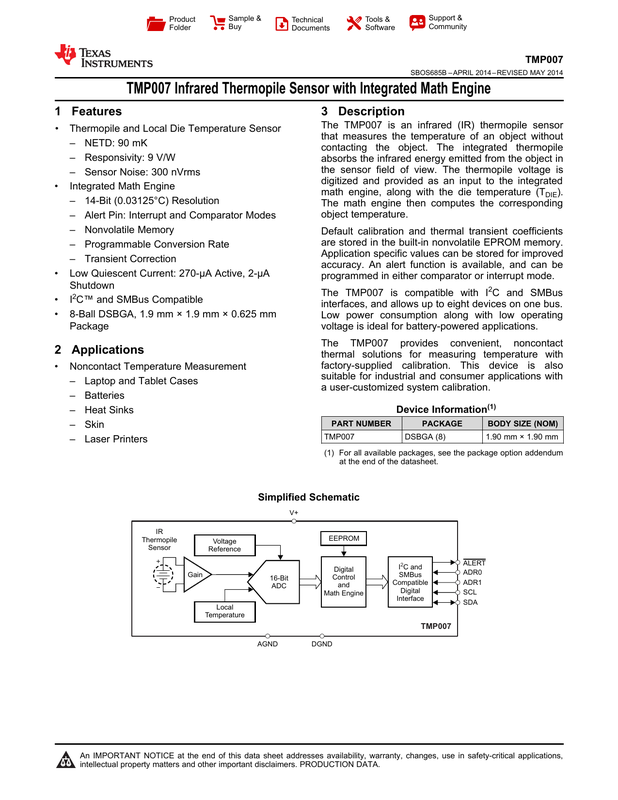 at the end of the datasheet. intellectual property matters and other important disclaimers. PRODUCTION DATA. NOTE: Page numbers for previous revisions may differ from page numbers in the current version. Operating Conditions. Exposure to absolute-maximum-rated conditions for extended periods may affect device reliability. Input voltage rating applies to all TMP007 input voltages. JEDEC document JEP155 states that 500-V HBM allows safe manufacturing with a standard ESD control process. JEDEC document JEP157 states that 250-V CDM allows safe manufacturing with a standard ESD control process. Object temperature is application dependent. 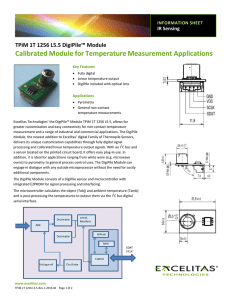 For more information about traditional and new thermal metrics, see the IC Package Thermal Metrics application report, SPRA953. At TDIE = 25°C, and V+ = +3.3 V (unless otherwise noted). recommended layout , and after system calibration with a common set of coefficients loaded. Average current over complete measurement cycle. NOTE: The responsivity is the slope of the lines. needed depending on the accuracy required. values in EPROM can be transferred to the registers either individually or as a complete set. be left floating if unused. If desired, ALERT may be shared with other devices for a wired-OR implementation. wavelength range of 3 µm to 20 µm. TMP007 is shown in Figure 18.
voltage proportional to the temperature difference between the hot junction, Thot, and the cold junction, Tcold. C is a constant depending on the design of the sensing element. value for VSENSOR and for TDIE, which are then placed in their respective registers. For each conversion cycle, the device generates an analog-to-digital converter (ADC) value for TDIE and TOBJ. The method and requirements for estimating TOBJ are described in the next section. S is a system-dependent parameter incorporating the object emissivity (ε), FOV, and sensor characteristics. The parameters S0, A1, and A2 are used in determining S.
The coefficients affect object temperature measurement as described in Table 1. The TMP007 default coefficients are calibrated with a black body of emissivity, ε = 0.95, and an FOV (θ) = 110°. most demanding applications, calibrate each device individually. change speed, sampling rate and so on). 3. Generate an optimal set of coefficients based on the collected data set. 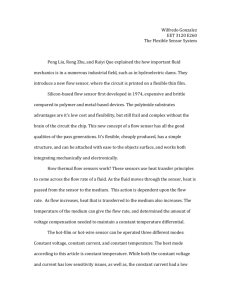 process using more environment points, data averaging, or narrow the temperature range of TDIE or TOBJ. nonvolatile memory into the coefficient register. averaged coefficient values in nonvolatile memory. 2. Object or objects in the field of view changed. 3. Object distance surface changed. 4. Angle between device surface and direction to the object changed. 5. Object and local temperature range changed outside the environmental calibration range. 6. Object and local temperature transients significantly changed. 7. Supply voltage changed more than 1 V.
8. Air convection or conduction near the device. 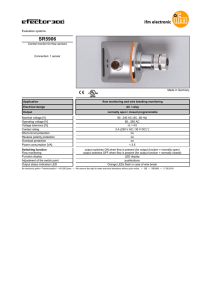 For further information and methods for calibration, refer to SBOU142 — TMP007 Calibration Guide. generates the start and stop conditions. to the master by generating an Acknowledge and pulling SDA low. high while SCL is high. bus. Pin logic levels and the corresponding address values are described in Table 2.
bit low. Every write operation to the TMP007 requires a value for the pointer register (see Figure 22). Note that register bytes are sent most significant byte first, followed by the least significant byte. The TMP007 operates as a slave receiver or slave transmitter. terminate data transfer by generating a start or stop condition. register indicated by the pointer register. Not-Acknowledge on reception of any data byte, or generating a start or stop condition. arbitration, the TMP007 ALERT pin remains active. 00000110, the TMP007 internal registers are reset to power-up values. TMP007 switches the input and output filters back to fast-mode operation. function, maintain a communication speed of at least 1 kHz for SCL operating frequency. Bus Idle Both SDA and SCL lines remain high. start condition. Each data transfer is initiated with a start condition. stop condition. Each data transfer is terminated with a repeated start or stop condition. determined by the master device. or stop condition on the bus. Acknowledge Each receiving device, when addressed, must generate an acknowledge bit. (1) on the last byte transmitted by the slave. Hold time after repeated start condition. After this period, the first clock is generated. The value of A2, A1, and A0 are determined by the ADR1 and ADR0 pins. The value of A0, A1, and A2 are determined by the connections of the corresponding pins. Master should leave SDA high to terminate a single-byte read operation. Master should leave SDA high to terminate a two-byte read operation. TC0 and TC1 are weighting coefficients programmable using the registers. TDIE_SLOPE is the change in die temperature with time. VOBJ_SLOPE is the change in sensor voltage with time. 1.5°C/min. When transient correction is on, the function corrects transients up to approximately 20°C/min. to a step change has a time constant of approximately five times the sampling time. coefficients to 0. The output filtering cannot be turned off with TC bit set to 1. This mode is often used to notify an external agent of an alert condition. checking the status of the nDV, MEM_CRPT, and DATA_OVF flags. conversion its respective enabled flag is asserted. After the flag is asserted, it can only be cleared by a read of the status register, which clears the flag and the pin. section); however, this action does not clear the flag. value returned for NWr depends on how many times that individual memory location has previously been written. sample flow is shown in Figure 27.
most recently written value is transferred from the memory to the register or registers. This is the digitized IR sensor voltage output in twos complement format. Temperature result. Bits 15 to 2. The data format is 14 bits, 0.03125°C per LSB in twos complement format. Full scale allows a result of up to ±256°C. Reset value is 00h. configuration register. This bit self-clears. Any conversion in progress is terminated. Selects the conversion mode of the device. Controls the Number of conversions used to generate the value in the VSensor and TDIE registers. There are a number of conversion modes available. and enable register. Writing to the ALRTEN bit in the status mask and enable register also sets this bit, and vice versa. conversion when all enabled flags are 0 in COMP mode. It is mirrored in Status register. Setting this bit turns on the transient correction enabling sensor voltage and object temperature output filtering. The INT/COMP bit controls whether the limit flags are in INTERRUPT (INT) Mode (0) or COMPARATOR (COMP) Mode (1). It controls the behavior of the limit flags (LH, LL, OH, OL) and the data invalid flag (nDVF) from the status register. If this bit is set, it indicates that the calculated object temperature is not valid due to invalid operations in the math engine. The bit is reset in the next valid conversion. these flags are set whenever the corresponding limit is violated at the end of a conversion, and cleared if they are not. after the local and object temperature conversions have completed and the results are ready to be read in the result registers. (TDIE, TOBJ, and so on). This flag is not affected by the INT/COMP bit setting and is always in latched mode. This bit is set to 1 if the result in the object temperature regsiter exceeds the value in the object temperature high limit register. In INT mode, this bit is cleared when the status register is read. This bit is set to 1 if the result in the object temperature regsiter is less than the value in the object temperature low limit register. In INT mode, this bit is cleared when the status register is read. In COMP mode, this bit is disabled and always reads 0.
temperature low limit. In INT mode, the bit is cleared when the status register is read. the end of the conversion if the calculated object temperature and sensor voltage are valid. Memory Corrupt Flag. Bit 8.
the internal check on memory. Mirror of this bit is in memory access register, bit 12. IR Data Overflow DATA_OVF Flag: Bit 7. This flag indicates if sensor voltage measured is over range. Combined with the data invalid bit, it tells why data is invalid. Bits 6 to 0: Not used. These bits always read 0. 0: ALRTF flag in status register cannot activate ALERT pin. 1: ALRTF flag any enabled flag in Status register will activate ALERT pin. Can also be set by its mirror in Configuration register, bit 8. 1: CRTF flag in Status register will activate ALRTF. 0: OHF flag in Status register cannot activate ALRTF. 1: OHF flag in Status register will activate ALRTF. 0: OLF flag in Status register cannot activate ALRTF. 1: OLF flag in Status register will activate ALRTF. COMP Mode: This bit is disabled in COMP mode and will always read 0. 0: AHF flag in Status register cannot activate ALRTF. 0: ALF flag in Status register cannot activate ALRTF. COMP Mode: This bit is disabled in COMP mode and always read 0. 0: Data invalid Flag in Status register cannot activate ALRTF. 1: Data invalid Flag in Status register will activate ALRTF. 0: Memory Corrupt flag in Status register cannot activate ALRTF. 1: Memory Corrupt flag in Status register will activate ALRTF. Not used; these bits always read “0”. TDIE Temperature Low Limit. Bits 15 to 6. S0 Coefficient Value. Bits 15 to 0. A1 Coefficient Value. Bits 15 to 0.
the TC0 and TC1 coefficients. All signed values are twos complement data. Manufacturer ID Bits. Bits 15 to 0. Read “TI” in ASCII code. The internal memory can be accessed through the memory access register. When the register is read, it returns the values in read name. Number of Programs. Bits 15 to 13. Memory Corrupt. Bit 12 (read only). This bit is a mirror of bit 8 in the status register. Memory Address. Bits 7 to 3. Used to specify register address to operate on. Address here is the same as the register in register address table..
General Load. Bit 2 (write only). Memory Store. Bit 1 (write only). Write 1 to this bit along with the register address to store that registers contents to memory. Performs an load of the memory contents to the register address determined by the Adr[4:0] bits. TC1 Coefficient Value. Bits 15 to 0.
applications where the object cannot be placed in thermal contact with a conventional temperature sensor. • Distance; the object is too far away, or in an inconvenient location for wired connections. • The object is in motion. • Direct contact of the object is inconvenient or uncomfortable (for example, skin). • The object is a fluid (that is, liquid or gas). • The object is hazardous (for example, acid or flammable). • The object is in a hazardous state (for example, high voltage). For this application, the system must operate over the environment described in Table 8.
points of the temperature ranges desired. In practice, it is best to include a number of intermediate points as well. This example uses the values shown in Table 9, with an X marking the values chosen for measurement. normal) distribution, the precision is typically characterized by the standard deviation (sensor noise), σ.
values are invalid before calibration. then the calibration accuracy is limited by external system factors (for example, convection or conduction). 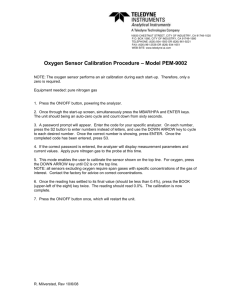 methods, see SBOU142 — TMP007 Calibration Guide. TOBJ_PREDICT is the temperature based on the calibration coefficients. TOBJ_ACTUAL is the known object temperature, measured independently. N is the number of devices in the calibration set. efforts of common versus unit calibration for a particular application. calculated in the usual way, by substituting TOBJ_PREDICT for the mean in the standard deviation formula. 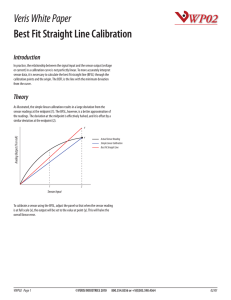 calibration is applicable for many application requirements. 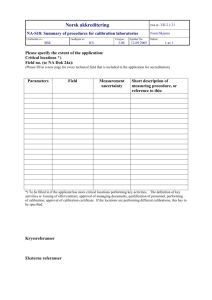 For this application, the system must operate over the environment described in Table 11.
application, the calibration set is weighted more densely around the region of interest. the accuracy by generating separate coefficent sets for TDIE = 25°C and TDIE = 30°C. The system accuracy is a function of TOBJ, TDIE, ε, and radiation transfer. used with a radiation transfer function responsivity value of 9 V/W to estimate system performance. R0 is the responsivity of the detector to a point source at an angle normal to the detector (θ = 0 in Figure 19. R0 has a value of ~10.8 V/W at 25°C. The responsivity value of 9 V/W is based on a system with a 110° FOV. εOBJ is the emissivity of the object (0.95). B is the Stefan-Boltzmann constant (5.67 × 10-12 W/cm2 /K4). TOBJ is the object temperature (273 K + 30°C). TDIE is the detector temperature (273 K + 23°C). θ is the half-angle subtended by the object as viewed from the detector. R0 is the responsivity (~10.8 V/W for the specified temperatures). r is the distance between the detector and the object (10 mm). D is the diameter of the object (15 mm). specific values for the parameters depend on the specific system details. (0.01 µF recommended) as close as possible to the device without obstructing the field of view. Figure 15. Typical values for shutdown current as a function of TDIE and supply voltage are given in Figure 14.
as other components, air currents, and so on. For more detailed information, refer to SBOU143 — TMP007 Layout and Assembly Guide. sensor output voltages in µV. measured in nW. 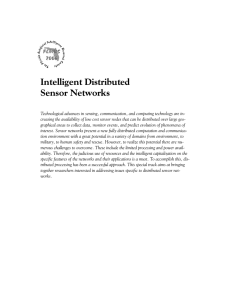 The NEP is a function of the sensor noise and the responsivity. and the system specific optical path. 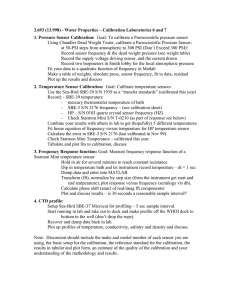 SBOU142 — TMP007 Calibration Guide. SBOU143 — TMP007 Layout and Assembly Guide. I2C is a trademark of NXP Semiconductors. appropriate precautions. Failure to observe proper handling and installation procedures can cause damage. susceptible to damage because very small parametric changes could cause the device not to meet its published specifications. This glossary lists and explains terms, acronyms and definitions. this document. 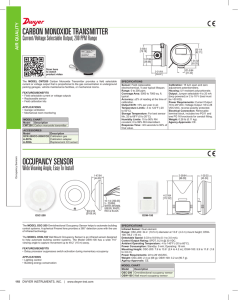 For browser-based versions of this data sheet, refer to the left-hand navigation. MSL, Peak Temp. - The Moisture Sensitivity Level rating according to the JEDEC industry standard classifications, and peak solder temperature. There may be additional marking, which relates to the logo, the lot trace code information, or the environmental category on the device. of the previous line and the two combined represent the entire Device Marking for that device. value exceeds the maximum column width. 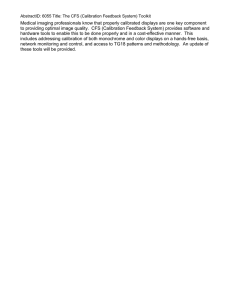 supplied at the time of order acknowledgment. third party, or a license from TI under the patents or other intellectual property of TI. documentation. Information of third parties may be subject to additional restrictions. voids all express and any implied warranties for the associated TI component or service and is an unfair and deceptive business practice. TI is not responsible or liable for any such statements. of any TI components in safety-critical applications. requirements. Nonetheless, such components are subject to these terms. have executed a special agreement specifically governing such use. regulatory requirements in connection with such use. non-designated products, TI will not be responsible for any failure to meet ISO/TS16949.